If you live in a cooler area, you know how those late frosts can damage plants, even if it is only a few degrees of cold. Once your plants begin to grow, they are more easily damaged, and since gardenias develop their flower buds early, a late frost can easily kill them. The Frostproof Gardenia is a new variety, especially developed to avoid that problem, so you get normal flowering, even after a late frost. 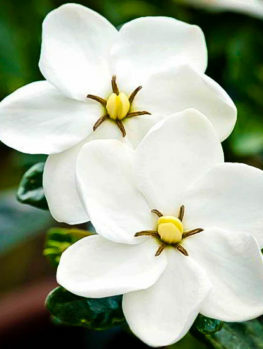 This amazing plant has all the delicious perfume of traditional gardenias, in beautiful double flowers, but it will grow throughout zone 7, with buds that are resistant to late frosts and which go on to develop into beautiful double flowers that spread that amazing exotic perfume throughout your garden. 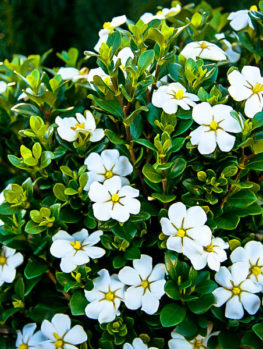 This evergreen shrub has attractive glossy rich-green leaves and it will grow into a shrub up to 5 feet tall and 4 feet across – you can even grow a gardenia hedge. The famous gardenia perfume will flow all summer from a succession of fully double white blossoms 2 inches across. Even when not in flower during the cooler months, this gardenia has such lovely foliage you will never stop admiring it. 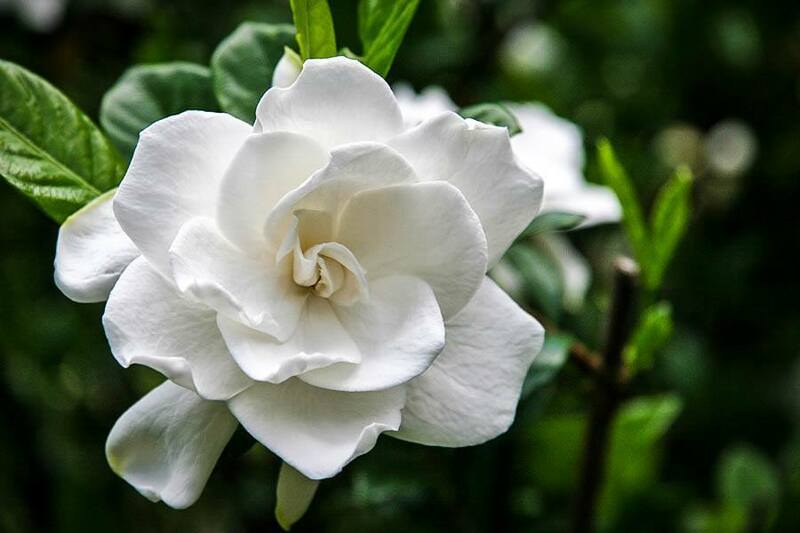 Plant your Frostproof Gardenia in a sunny or partially shaded spot in well-drained soil, preferably slightly acidic. Add plenty of organic material to the soil and apply organic mulch every spring. Water regularly so that the soil never dries completely. This plant has no significant pests and disease and is not even eaten by deer. For a hedge, clip once a year after flowering ends. The Frost Proof Gardenia is a true breakthrough in plant selection. Unlike old-fashioned gardenias, it is hardy all the way through zone 7, and avoids late frosts that kill the flower buds on older types. 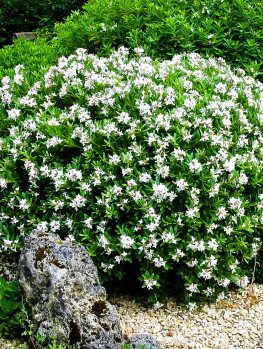 It grows into a 5-foot tall evergreen shrub with glossy dark-green leaves and richly-fragrant double white blossoms all summer long. It just needs a sunny, sheltered spot and plenty of water to give you the pleasure that was once only possible in the South and West. The Frost Proof Gardenia is surprising easy to grow with just a little care and it will bring its unique tropical scent to you garden – something you once could only dream of. 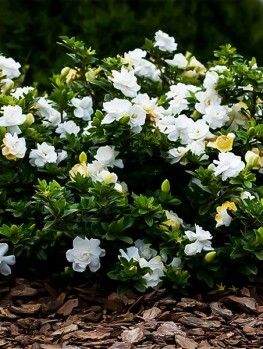 Although Gardenias have a reputation for being difficult to grow, you really just need to give them what they want – a sheltered, sunny spot, enough water and the right fertilizers and they will thrive. They have few pests or diseases and will stay healthy and bloom well if they just receive a little care. Your Frost Proof Gardenia will grow steadily 6 inches a year or more. 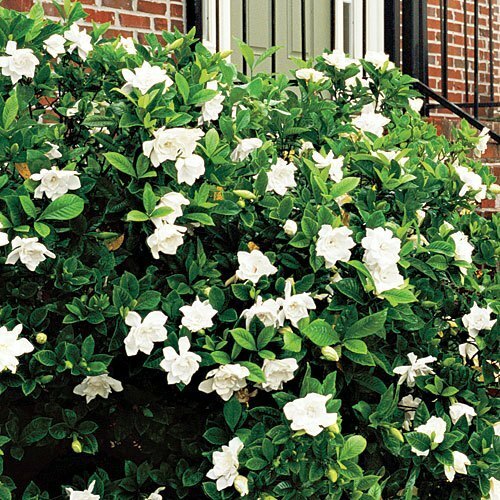 The Frost Proof Gardenia grows into an evergreen shrub up to 5 feet tall and 4 feet across. 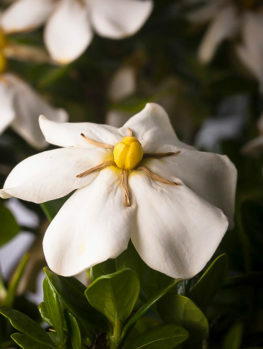 The dark-green, glossy leaves are smaller than on regular gardenias, but the flowers are the same, around 2 inches across, a full double flower, with thick white petals and that unique gardenia fragrance. 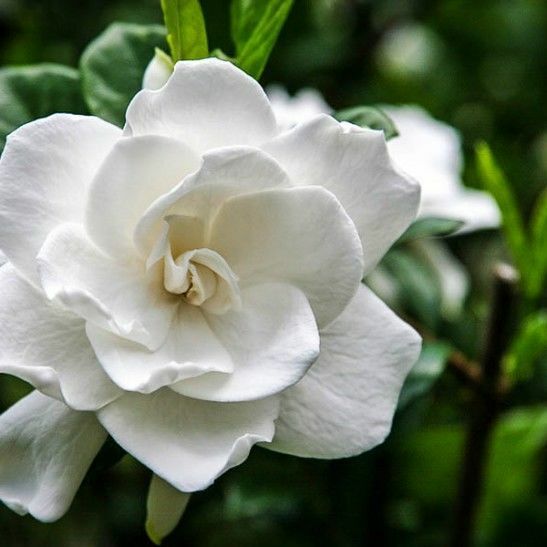 Older types of ‘hardy’ gardenias had poor scent and plain, single flowers, but Frost Proof is the real thing – a true, fragrant gardenia flower hardy from zone 7 all the way to zone 11. 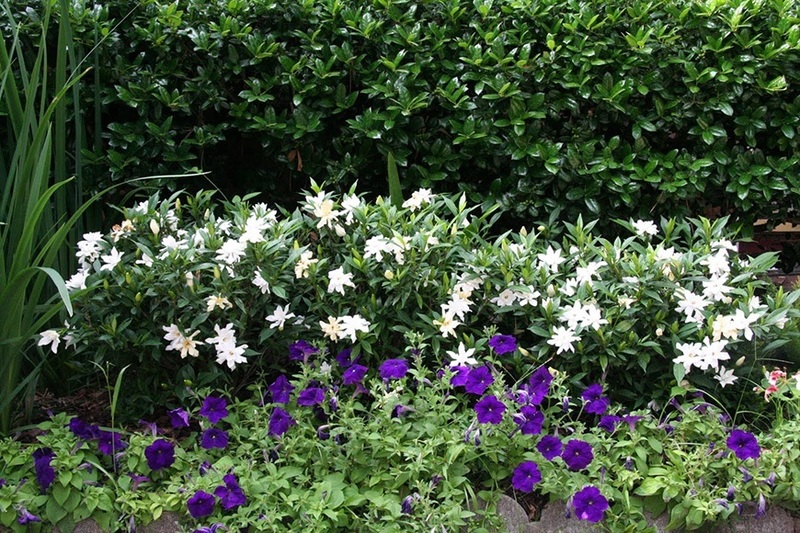 Gardenias are easy to grow if you create the right conditions. They like acidic soil with plenty of organic material in it. 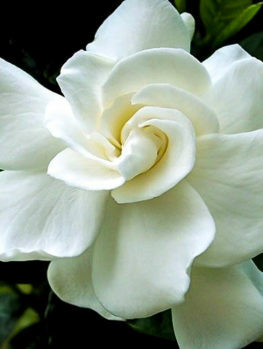 However, if you don’t have acid soil you can still grow the Frost Proof Gardenia by using a special fertilizer called chelated iron, which you water onto your plant and soil in spring and again in late summer. This will give your Frost Proof Gardenia the iron it needs to keep the leaves a rich, dark green and to keep the plant strong and healthy. Mulch once or twice a year with compost or peat-moss and keep well-watered. Gardenias like plenty of water, so never let the soil become dry around your plant. Of course you shouldn’t keep in standing in water either, so water only when the soil is just beginning to dry out. Use a fertilizer for acid-loving plants. Apply powder fertilizers in early spring and again in mid-summer, and apply liquid fertilizers once a month from spring to September. If a cold-snap is expected or heavy snow, wrap some plastic mesh around the plant to protect the branches from breaking. That is all the protection your Frost Proof Gardenia needs. No pruning is necessary unless you want to control the size, or make a hedge, in which case you should prune as soon as flowering is over for the season. 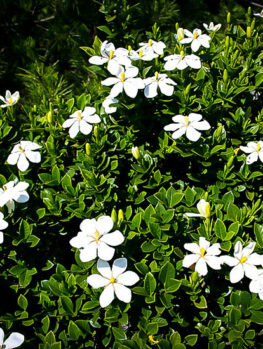 Gardenias do best in full sun or a mix of sun and some shade so choose a sheltered spot facing south. If you are in zone 6, shelter is important – in front of a fence or evergreen hedge would be a good location, for example. Don’t plant near freshly laid concrete, which stops the soil from being acidic. If planting a group or row, allow 2½ – 3 feet between the plants. The gardenia, or Cape jasmine (Gardenia jasminoides), grows wild from India east through Vietnam and southern China to Japan. It has been grown for its fragrance and beauty in China for a thousand years, and was first grown in America in Charleston, South Carolina around 1762. It became so popular that it was quickly spread across the South and has become a symbol of Southern life – lazy summer evenings with its intoxicating perfume drifting across the veranda. However, until now, that decadent pleasure could not be enjoyed unless you lived in warm southern areas. The Frost Proof Gardenia is such a special plant that it must be produced directly from trees absolutely known to be the correct variety. Our trees are grown the correct way, from branch cuttings of these specially bred plants. That way every tree is identical to the original. However these take longer to produce, so avoid cheaper, gardenias that will only be a disappointment. If it doesn’t say ‘Frost Proof’ it isn’t the gardenia you need. We sell only plants that are true to the original form and we always give you the best plant for your purpose. However we are constantly renewing our stock so our customers get fresh, healthy plants, so supplies of this amazing plant may be limited. 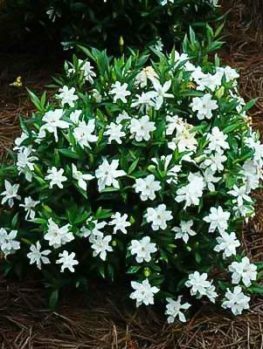 If you like this plant, we invite you to browse other varieties like the August Beauty Gardenia or the ScentAmazing Gardenia.